Takes licking your plate to a whole new level – and sure cuts down on the dishes! 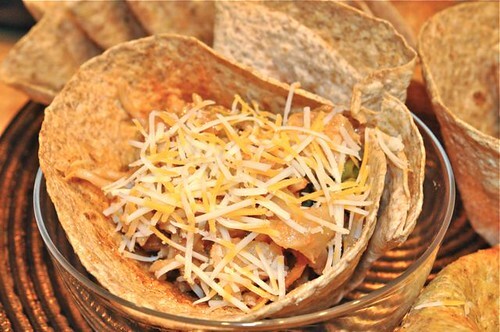 Yes, we have to give taco salad the credit for putting these babies on the map – the infamous “salad” and I say “salad” ’cause, if you’re not careful, many a taco “salad” can hover around 1000 in the calorie department and wait for it – 50+ grams of fat! Yikes! 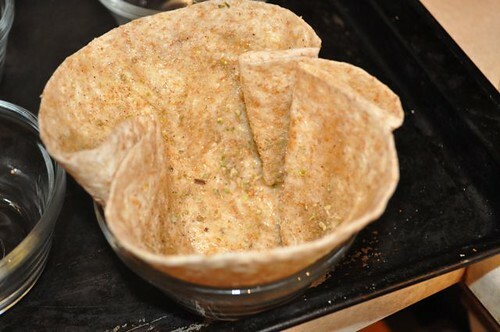 And much of those calories and that fat are found in the the bowl – the bowl! 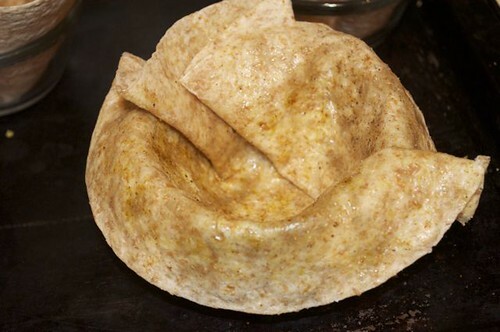 So let’s get that bowl out of the fat bath and put it in a hot dry oven and see who has the last laugh – and I guarantee we won’t have to wait to hear singing, ’cause it is so over when it comes to tortilla bowls from a fryer! 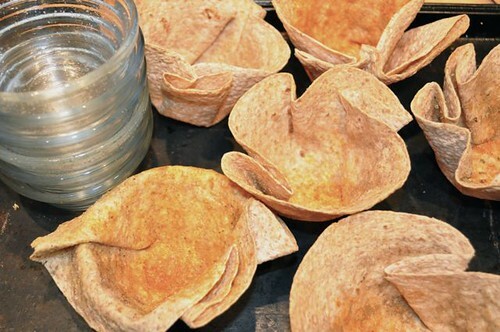 All you need is oven-safe bowls or jars or if you’re lucky, get your hands on tortilla shell molds, fun, but not necessary. And a word about the seasonings – flavour them up anyway you like – salty, sweet, spicy, herby, or nothing at all, though you will miss an opportunity to add some excitement. Anything goes, you’re working with a blank canvas, so depending on what you’re going to fill your edible bowl with – accessorize as you see fit. I’ll leave you with a brush of vegetable oil followed by a sprinkle of sugar and cinnamon – leaves an ice cream cone in the dust! Happy bowling, I mean bowling. 1. 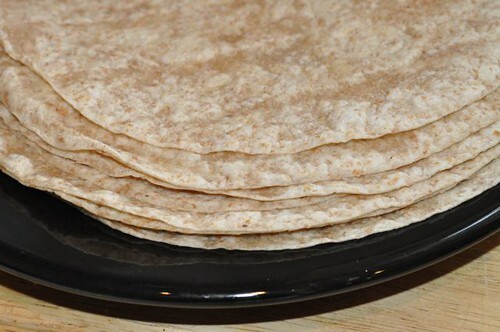 Get your stack of tortillas. 2. 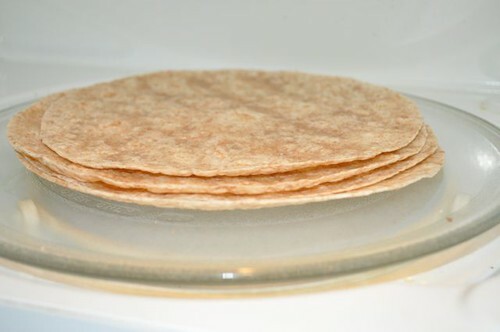 Warm a few up at a time in the microwave – 10-15 seconds – they’re much more pliable and won’t tear when they’re warm! 3. 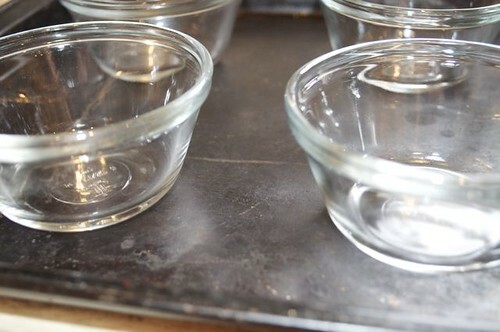 Arrange what you’re going to mold them in or over on a baking pan – and if it’s over, your jar or bowl should be over too. 4. Gather the flavours – mix it up, they’re your bowls – season ’em up any way you want. 5. 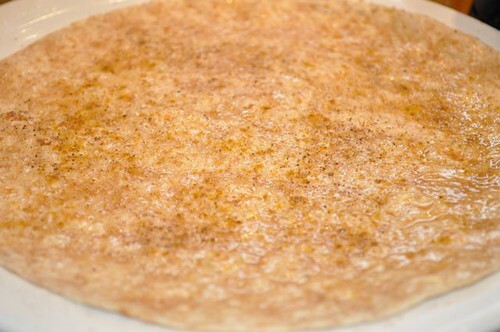 Brush with oil, lay another tortilla over top, that way the 2nd tortilla gets a little oily love from the one below. 6. See? Keep going until you’ve brushed them all. 7. 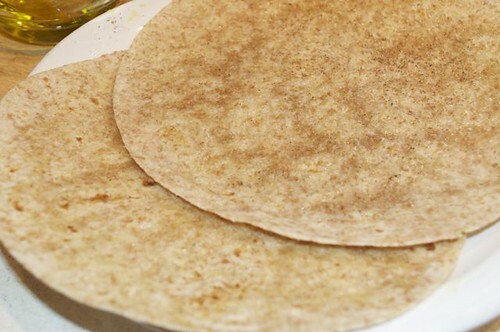 Sprinkle some with smoky paprika, onion powder – and always salt! 8. 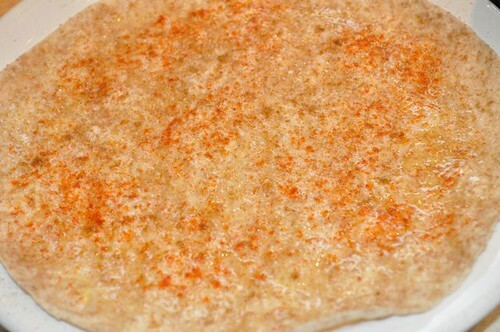 Sprinkle others with cumin and curry – and always salt. 9. 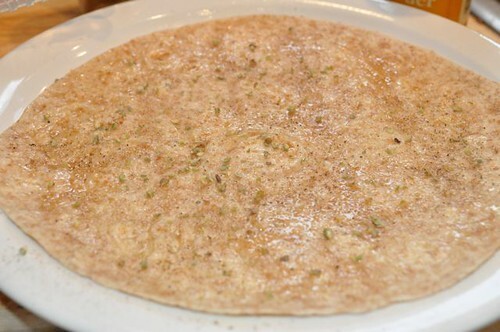 Or onion powder and oregano – and, that’s right – always salt. 10. 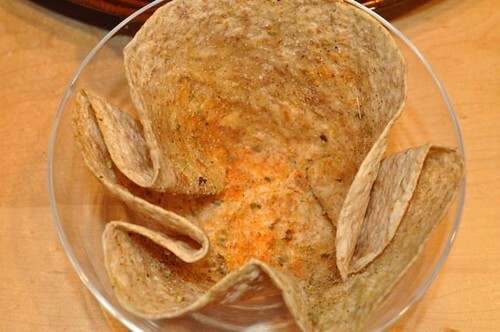 Fold them in before molding them to the bowl. 11. Press the edges out just like this. 12. 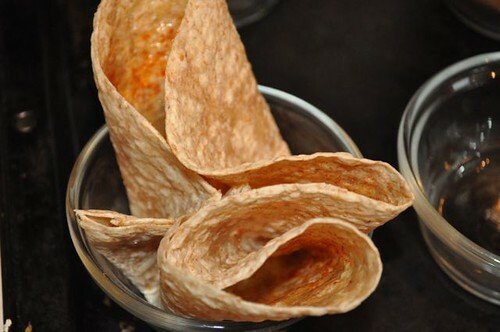 Or bend the edges flat to create a more dramatic sombrero kind of shape. 13. Or leave the edges vertical for a tulip effect. 14. 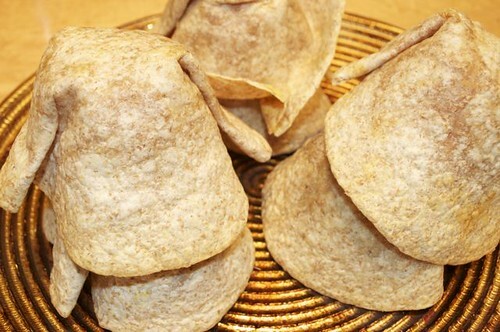 Keep going until you have all your tortillas in or over bowls – bake for 10-15 minutes until lightly brown and crisp. 15. Just like this – leave them in or over the bowls until cool. 16. 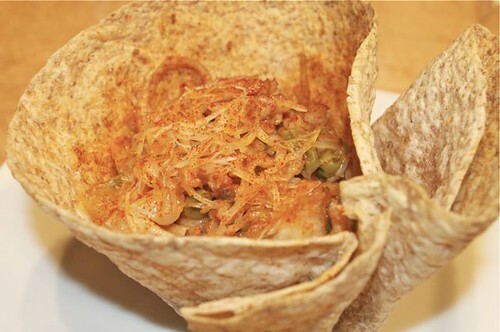 Take the cooled tortillas out of the bowls and voilà – tortilla bowls ready for anything. 19. 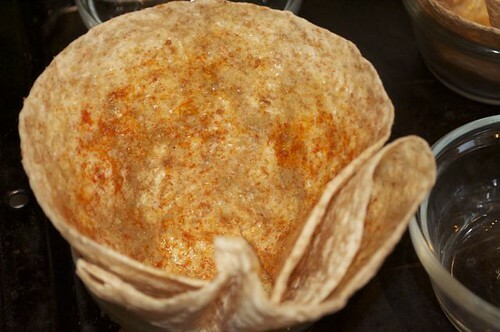 And there you have it – a crispy, seasoned tortilla bowl ready for filling. 20. I happen to have a little pasta casserole that I piled in and topped with grated cheese. It can easily stand up to a brief zap to melt the cheese if you wish. 21. Just like this – and look Ma, no hands! Bowls are doin’ it for themselves and so can you, so start eating your bowls instead of washing them! 4. 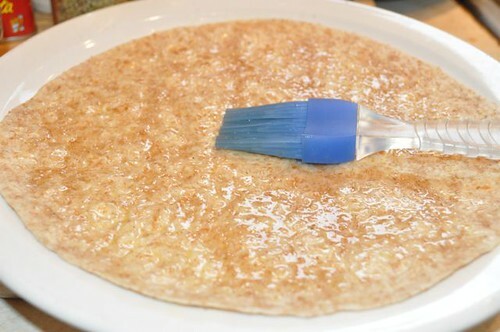 Take your softened tortillas, brush them with oil on one side and lay another tortilla over top and keep brushing with oil until you have a stack of oiled tortillas. The other side gets slightly oiled just from the stacking. 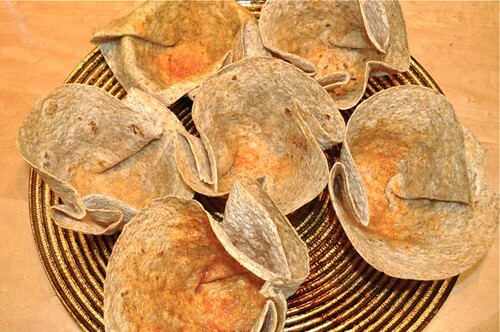 Season as you wish and either mold them inside the bowls or drape them over them once you’ve turned them over. You know the shape you’re after, so mold accordingly. 5. 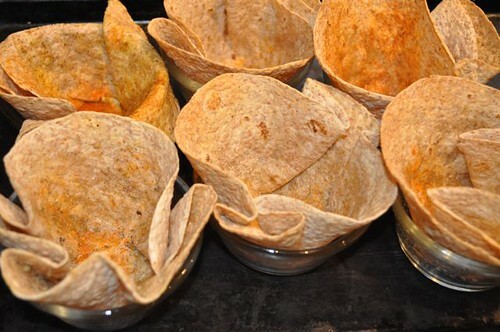 Bake the tortilla bowls for about 10-12 minutes, until they’re browned and crisp, being careful not to burn them. 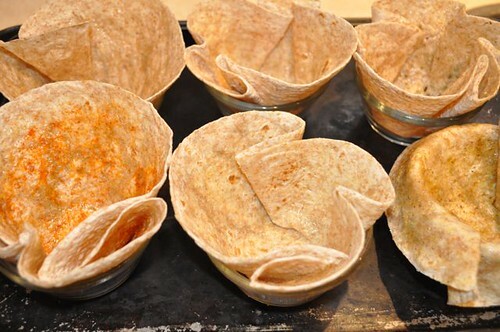 Remove the baking sheet from the oven, let the tortillas cool before carefully removing them from the bowls. Pile them on a platter, make more bowls or start filling them. After a brush with olive or vegetable oil – start sprinkling.